It’s our final Q&A session with a finalist of the Beer Is Culture art and design exhibit! Bob Rucci came up with this great visual concept to represent the universality of beer, above. Next time you’ve got a frothy head on a glass of beer, see what it forms instead! We’ve drilled Bob for more on his work (which was uploaded to the Sixpoint wall by his wife Alison, hence her name being attached to it there), and wanted to remind everyone that voting closes tonight, Saturday May 7th, at midnight EST. So “like” your favorite now — and see which finalist wins on Monday! BR: I studied for four years upstate, and have a degree from R.I.T. BR: I get inspiration anywhere and everywhere. Just seeing the submissions in this competition, it is amazing that there are so many talented people out there. Even better that they are talented people with excellent taste in beer. BR: As a designer, it is my job to communicate the client’s message to the intended audience. the client’s message must take center stage. BR: I think beer is culture because it is a common thread of many societies. 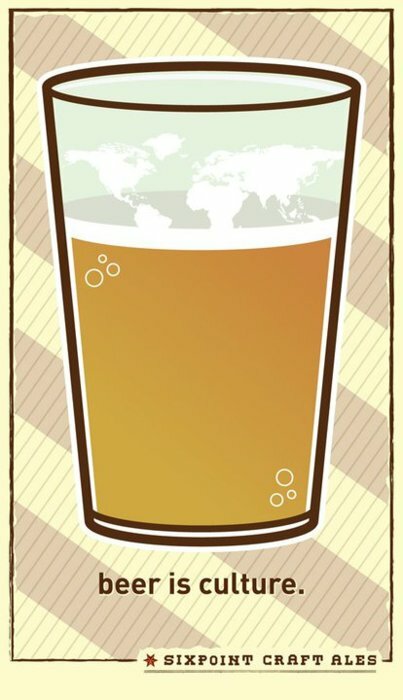 I love being able to try different beers and beer styles from all around the world, it makes me feel more “cultured”.